GREENSBORO, Ga. – A Ritz-Carlton situated in a small town in central Georgia? At first that seemed hard to imagine. Never have I seen waterfalls used as cleverly as I did at The Oconee. Ritz-Carlton has 94 locations world-wide but the 251-room facility here is the only one that is designated as a lodge. Reynolds Plantation also has 117 holes of great golf, an irresistible attraction for those visiting the Masters tournament in Augusta every April. 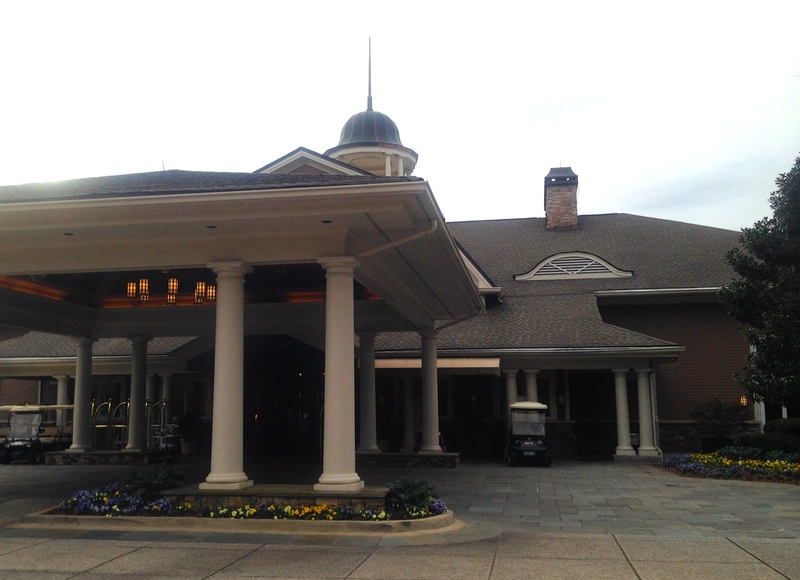 Located barely over an hour from that tournament site, the Ritz-Carlton Lodge traditionally sells out for Masters week a month after the previous year’s tournament at Augusta National. This year is no exception. The day after the Masters concludes TaylorMade adidas will launch a new high-tech golf shoe at Reynolds Plantation, which will keep the resort in the golf spotlight even after the tournament is over. “The Masters is our Super Bowl,’’ said Ralph Vick, the hotel’s general manager. There’s no doubt about that. Vick said room rates start at $388 on most nights during the course of a year. During Masters week in April they start at $1,000. That’s not just because of the quality of the hotel. The golf options are extraordinary, and that’s been underscored since MetLife took over ownership of Reynolds Plantation two years ago from the family that created it. Lake Oconee provided a picturesque backdrop on many holes at the Reynolds Plantation courses. Visitors during this year’s Masters will see some major upgrades at The National course, a Plantation favorite. 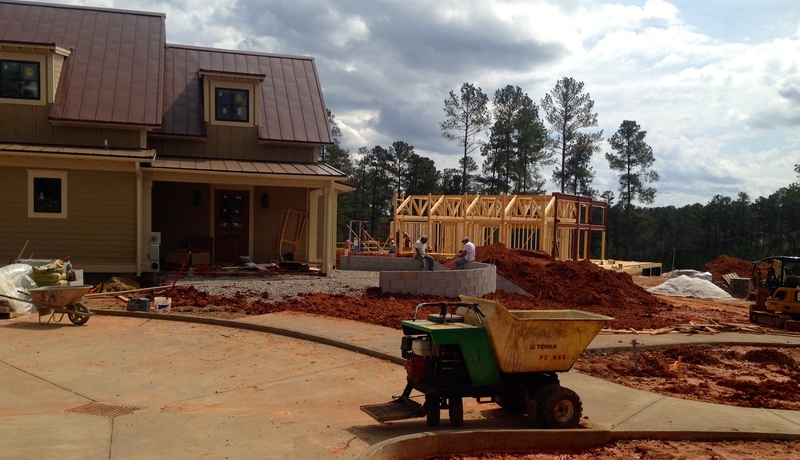 A new clubhouse, pro shop and cart storage building are in various stages of construction. Obviously the goal is to have as much done as possible in time for the first major golf championship of 2015. The Ritz itself will also have a new expanded swimming pool area. Golf-wise Reynolds Plantation has an interesting location. It’s within a reasonably short drive of both the year’s first championship (the Masters) and The Tour Championship, the climax to the PGA Tour’s FedEx Cup Playoffs in October. The Tour Championship is played at East Lake in Atlanta, but vice president of golf operations Mark Lammi says there’s no question about which big tournament has more impact at Reynolds Plantation. It’s the Masters by a long shot. Turtles wanted to stick together when golfers were approaching. 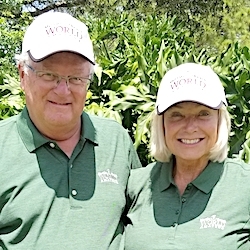 Golfers will flock to the 10,000–acre community in April, and it won’t be just to watch the competition at Augusta National. They’ll also be playing the courses built around the beautiful Lake Oconee. It’s the second-largest lake in Georgia, spreading over 19,000 acres and having 374 miles of shoreline. 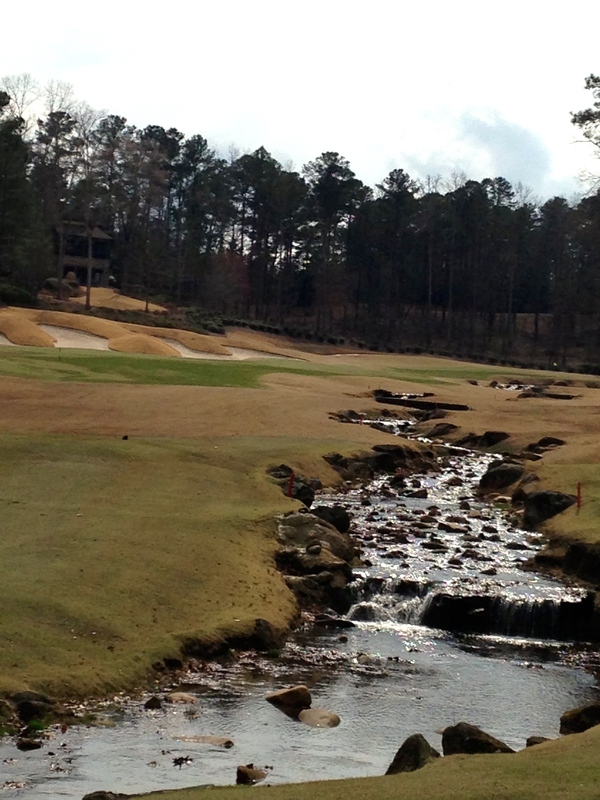 All of the Reynolds courses touch Lake Oconee at some point. The 117 holes are spread over six courses. One, The Creek Club, is private. The members-only layout was designed by Jim Engh and opened in 2007. Engh, Golf Digest’s first Architect of the Year, created a somewhat short course (6,490 yards from the back tees) that has three par-threes, three par-fours and three par-fives on each nine. And, each hole has seven tee placements. Only one of the other five courses offers openings for public, non-resort, play. That would be The Landing, the first course built in the area in 1986. It’s one of two Bob Cupp designs at Reynolds Plantation and was originally known as Port Armor Golf Club. Immediately well-received upon its opening, the course was acquired by Reynolds Plantation in 2005. 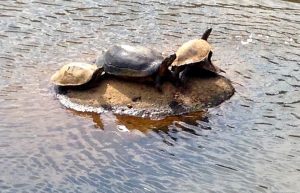 Only resort guests can play on the other courses. Construction is underway on a new clubhouse, pro shop and cart storage building at The National. The other Cupp course is The Plantation, which he designed with consulting help from PGA Tour players Hubert Green and Fuzzy Zoeller. It opened in 1988, when Golf Digest named it Best New Resort Course. Our visit centered on the other three courses, all created by the highest of high-profile designers. The one we liked the best of The Oconee, a Rees Jones creation. Jones was in the early stages of building his reputation as “the Open doctor’’ when he did his work on The Oconee. He would eventually redesign seven U.S.Open courses and three layouts that have hosted Ryder Cup matches. Chicago’s Medinah No. 3, which has hosted both big events, was one of them. The TaylorMade Kingdom offers high-tech solutions to golfers’ problems. 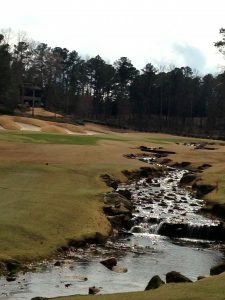 The waterfalls that define several fairways are the stunning special feature of The Oconee, which opened in 2002 and is the closest layout (just a short walk) to the Ritz-Carlton Lodge. Water comes into play on nine holes, including the last three, and the par-threes are outstanding. Toughest of the Reynolds courses is the Jack Nicklaus-designed Great Waters, which first greeted golfers in 1992. 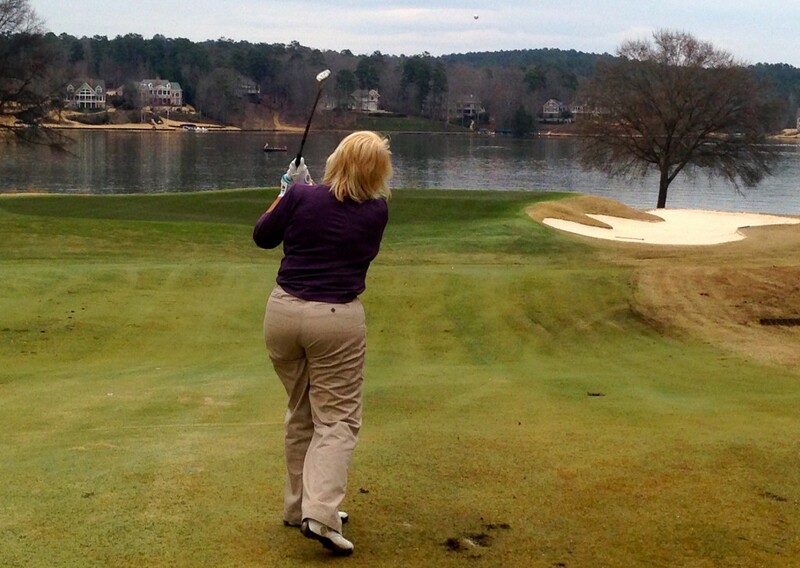 The nines are completely different, with the back having eight holes right on Lake Oconee. Great Waters was the site of the Andersen Consulting World Championship in its early years and was the most recent Reynolds course used for a somewhat high profile event. The first 72-hole Big Break Invitational was played there last year and was broadcast on The Golf Channel. Last of the layouts, The National, has the other 27 holes. Architect Tom Fazio had the Ridge and Bluff nines ready for play in 1997 and the Cove made its debut in 2000. These nines differ from Reynolds’ other courses because of their more pronounced elevation changes. 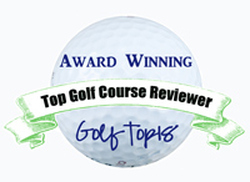 All the courses have generous fairways and offer fun challenges for resort visitors. The putting surfaces would obviously vary in difficulty according to the time of the year, but the least undulating were the greens on The Oconee. 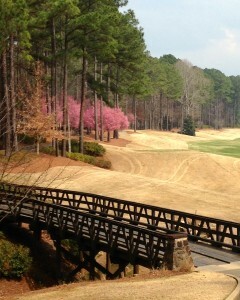 Stylish bridges and ornamental cherry trees added to a pleasant golf experience at Reynolds Plantation. The Reynolds Plantation golf experience doesn’t end with the courses. 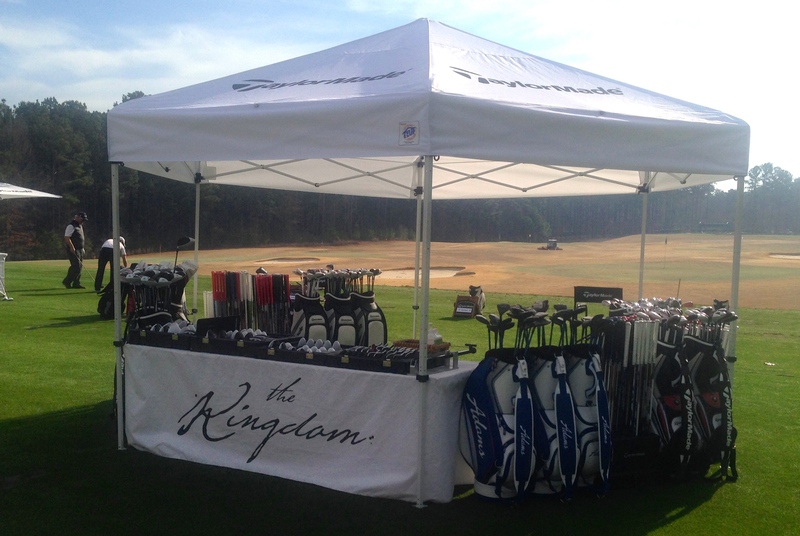 Director of instruction Charlie King, one Golf Digest’s 50 Best Teachers, oversees the Reynolds Golf Academy and cutting edge technology is available at The TaylorMade Kingdom. It offers swing analysis, club-fitting and on-site club building so well respected that PGA Tour players have made it a frequent stop. In fact, the only other such facility is at TaylorMade’s headquarters in Carlsbad, Calif.
Kingdom’s high-tech tools include Motion Analysis Technology, the Quintic launch monitor system to improve putting techniques and Trackman and Flightscope X2 launch monitor technology. Four experts in the use of this equipment are available to make good things happen to visitors’ golf games. The Ritz-Carlton Lodge stands out in the small central Georgia town of Greensboro. Reynolds Plantation isn’t all about golf. The Ritz-Carlton Lodge offers a variety of dining options at the Linger Longer Steakhouse, Georgia’s Bistro and Gaby’s, a lakeside café, and the clubhouse at each of the courses also offer dining options. In addition, there’s a 26,000 square foot spa, boat cruises, the Lake Club Wellness Center and Tennis Center, swimming pools and all sorts of activities on Lake Oconee, which has four full-service marinas. Again, however, golf is the biggest thing. Reynolds Plantation has been rated with Pebble Beach, Pinehurst and Wisconsin’s American Club as the best golf resorts in the country by Zagat Survey. I’m not big on those rating games, but I’ve been to the other three major U.S. resort destinations. Reynolds Plantation differs from the others in that it hasn’t hosted the big tournaments but – as a destination for avid players – it’s every bit the equal of any resort in the country.